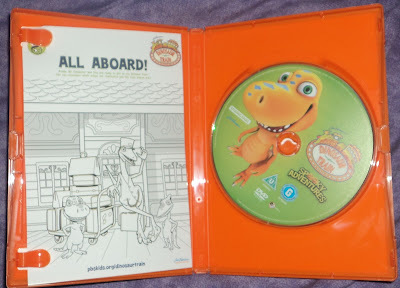 When we reviewed a Dinosaur Train DVD we absolutely loved the show. Little man loves the colourful characters and he actually stays still for more than a nano-second and watches the show which is very rare. 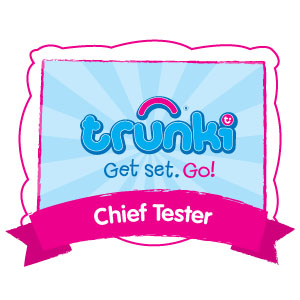 I loved the animation and was impressed that they had made the show both entertaining and educational for little ones. Unfortunately we do not have access to Nick Jr. to watch the show but when we visit Dadcu (grandfather in Welsh) if the show is on we always make the most of his sky and satisfy our love of the show by watching new episodes. As little man loves watching the DVD again and again I always keep my eye out for any new Dinosaur Train DVD’s that are released to give little man some variety; so when I heard that a new DVD called ‘Dinosaur Train – Spooky Adventures’ was being released I could not wait to get it and see what exciting adventures the loveable characters from Dinosaur Train go on. 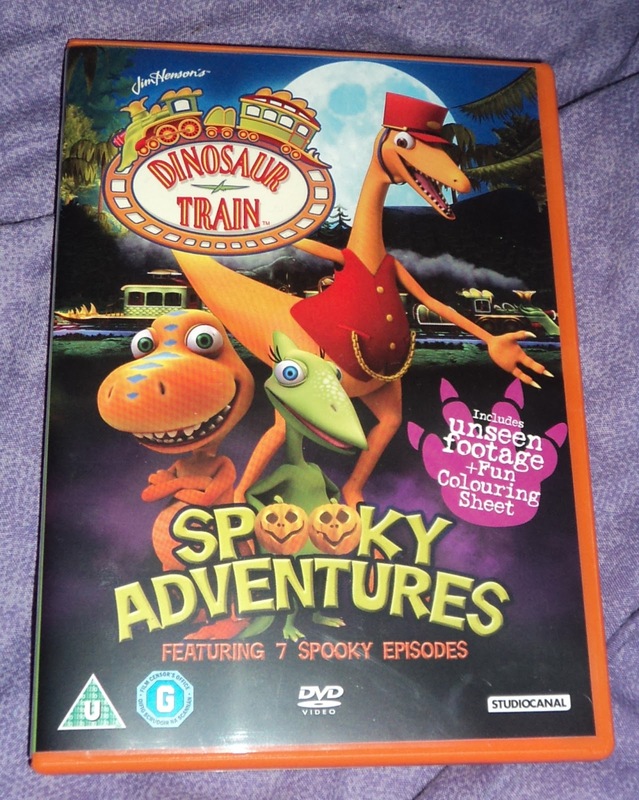 Not only does this DVD include seven spooky adventures it also has never seen on TV educational clips from resident Palaeontologist Dr Scott, providing children with added educational facts and information. 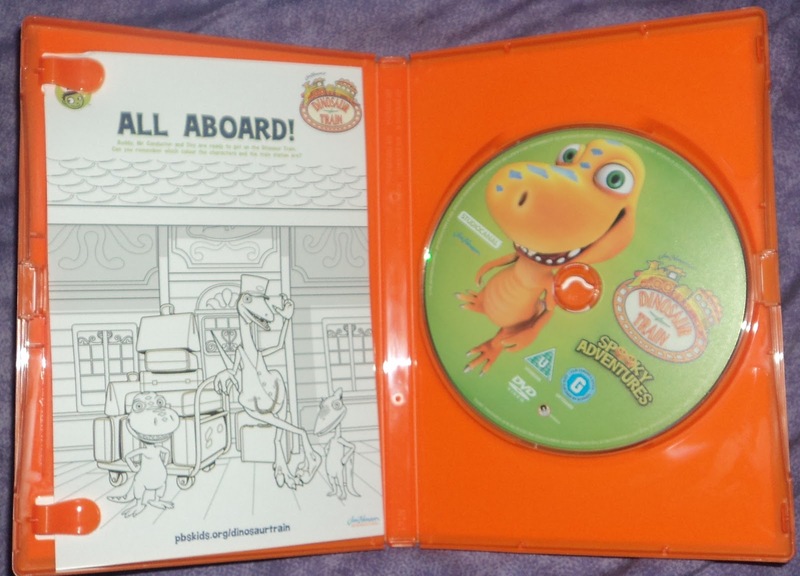 With the DVD you also get a fun colouring sheet for little ones to add their own creative flair to a Dinosaur Train picture. In this enjoyable episode Buddy, Tiny and Don search around the Big Pond for fossils as they have fun playing ‘detective’. They succeed in finding fossils, ending up finding an entire skeleton of a Jurassic dinosaur. In this episode we see the Buddy and his family help Tank Triceratops with his awkwardness about having a huge head, they help their friend but showing him how amazing his features are especially his frill. In this episode Buddy loses a tooth and so that he can learn about T.Rex teeth his mum takes him to Rexville where his Tyrannosaurus friends help him learn that he will grow new teeth to replace the old ones. 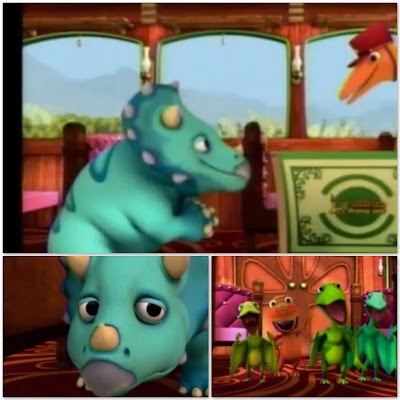 In this episode Buddy and his family spends time with Laura the Giganotosaurus who is a large dinosaur who always rides the Dinosaur Train and keeps an eye out for any dangers ahead on the track. They learn that, like Buddy, Laura is a three-toed theropod and they also learn that she is an avid bird-watcher. 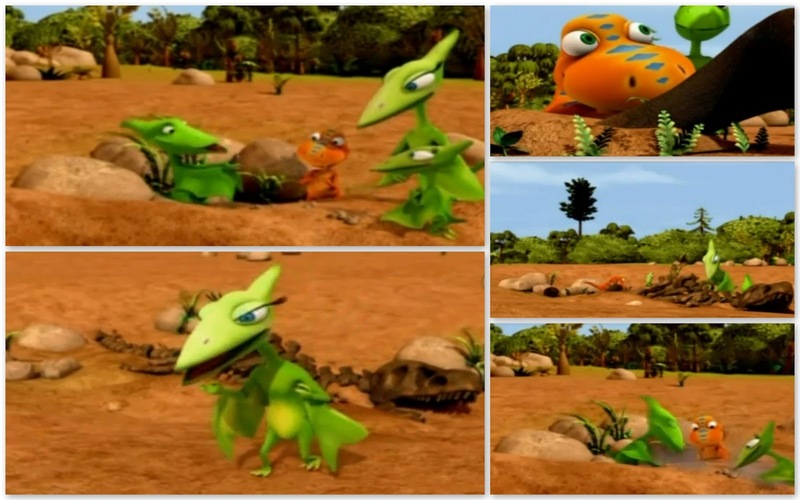 Whilst on a day out Buddy and Tiny help settle an argument between two very big dinosaurs, Morris Stegosaurus and Alvin Allosaurus; one has a very spiky tale and the other has a mouthful of sharp teeth. 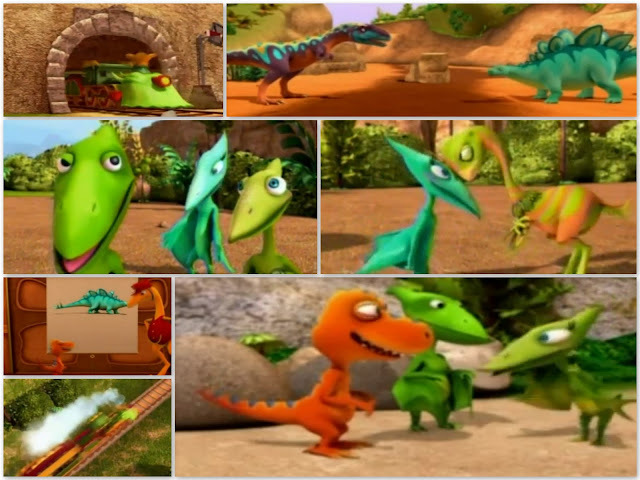 In this episode Tiny and Buddy meet some of the biggest land creatures ever when they visit a dinosaur family of Argentinosaurus. Whilst visiting the Argentinosaurus family they learn about the benefits of being really big as well as learning that it is also great to be their own size. It is great to see the very cute Buddy have fun exploring with his family and meet new friends on the exciting adventures in the great episodes included on this DVD. Night Train is a great episode and it is interesting that an exciting adventure happens during the night. Little man is fascinated with this episode and it always catches his attention when I put it on; I believe this is partly because Dad, Buddy and Tiny stand out in the darkness due to their bright colour, making them very eye catching. I think Night Train is the spookiest episode on the DVD and little man giggles as Buddy and Tiny are spooked throughout the episode and he finds the Conductors fun antics entertaining. I personally think it is a shame that there are not any more episodes on the DVD where Buddy has an adventure during the night as I think the night adds a spooky element to his escapade. Even though I would have liked to have seen more episodes with an emphasis on a spooky adventure I still think the DVD is great as it is full of fun episodes that little man loves to watch. Little man enjoys watching all of the episodes and loves the bright colours and interesting dinosaurs that feature in the different episodes. Often when watching the DVD little man has had a little dance to the fun, entertaining songs that have performed within the episodes. 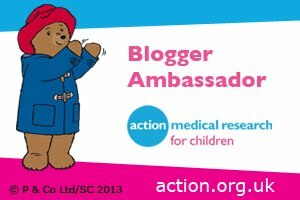 I like the inclusion of songs in the show as it makes it more fun for little ones and they learn language skills, creativity and music skills through listening to the songs as well as develop their co-ordination and motor skills if they have a little dance to the songs. This DVD is great for pre-schoolers and even though it is titled Spooky Adventures which suggests it is perfect for Halloween, I am sure all of the episodes would be enjoyed by little ones any time of year; I know little man will love watching this DVD throughout the year. In spite of the title being Spooky Adventures the episodes are not too spooky or scary for little man and instead of being scared he was intrigued. I think the show has achieved a great level of spookiness for pre-schoolers to enjoy, combining a hint of spooky with fun making entertaining episodes for children to love watching. 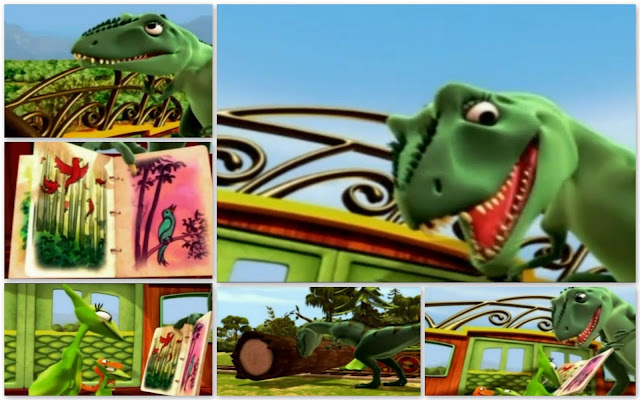 As with all other episodes of Dinosaur Train we have watched the characters are great and Buddy is his adorable, loveable self. 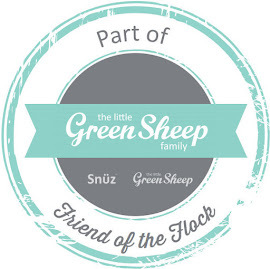 The antics of the family in each of the episodes make for great entertainment for young children. 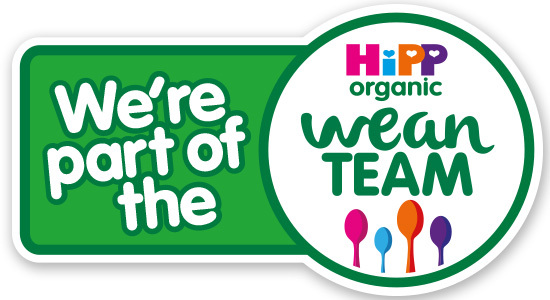 I love the combination of entertainment and education that is included in all of the episodes and I think the show achieves the perfect blend of fun, amusing and interesting stories with loveable characters and scientific facts and information. This Dinosaur Train Spooky Adventures DVD along with other episodes of the hit show satisfies little man’s fascination with dinosaurs and trains and I love that whilst he is watching a colourful, brilliantly animated show that he loves and is fascinated by he is also learning about dinosaurs, natural science and history and Palaeontology. Also I love the fact that as well as teach children about science and dinosaurs in an entertaining way the show also teaches children about other facts and skills including team work, problem solving, investigating and language skills. 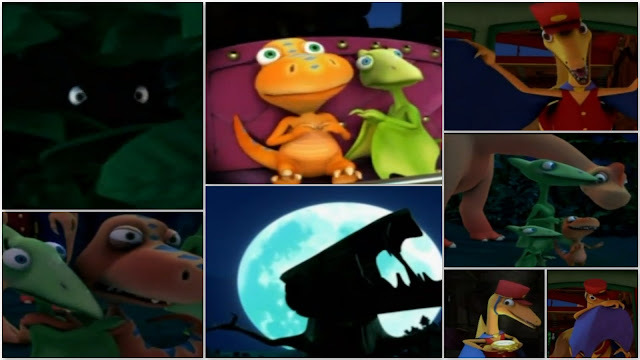 Tim Henson's Dinosaur Train Spooky Adventures was released by StudioCanal in the UK on the 1st of October 2012 and is available to buy from all good retailers including Amazon, Tesco, Play.com and HMV. More information about Dinosaur Train.